Dr Prahlad Ho, Program Director of Diagnostic Services and Director of Clinical Haematology, was recently awarded his PhD for his thesis, ‘Evaluation of the management of venous thromboembolism and application of novel global coagulation assays’, completed in conjunction with the Florey Institute of Neuroscience and Mental Health, University of Melbourne. Dr Ho is a joint NHMRC and Heart Foundation Scholar, who studied the risk of clot recurrence in patients with venous thrombosis by the use of novel global coagulation assays. His work has defined subgroups with higher risk of recurrence, as well as identified unique mechanisms that regulate clot dissolution, adding enormous value to existing knowledge. “When I started this interesting and rewarding journey in 2014, my bemused colleagues firstly asked why I was doing a PhD, then why I was doing a PhD in thrombosis and then why at Northern, as they thought I would never succeed doing research here,” Dr Ho says. Cardiovascular disease and thrombosis remain a leading cause of mortality and morbidity in Australia. For Dr Ho, Northern Health is ‘home’ – where all the patients are, where he began his internship and where he received postgraduate fellowships from. The last five years at Northern Health have proven those doubts wrong and highlighted that research and clinical practice needs to go hand in hand. The epidemiological arms of Dr Ho’s project, which reviewed over 1,000 deep vein thrombosis (DVT) and pulmonary embolism patients at Northern Health, has highlighted the importance of minor venous thromboembolism, such as below knee DVT and provoked events, which have substantial rates of recurrence and morbidity. This review, which has been published in four international journal articles, formed the basis of the creation of Northern Health’s very own Thrombosis Service, which reviews over 1,000 patients every year. Similarly, the challenge to clinicians today remains the ability to predict the risk of thrombosis and cardiovascular disease within our population. “To address this, we looked at new blood biomarkers that evaluated the whole clotting system. 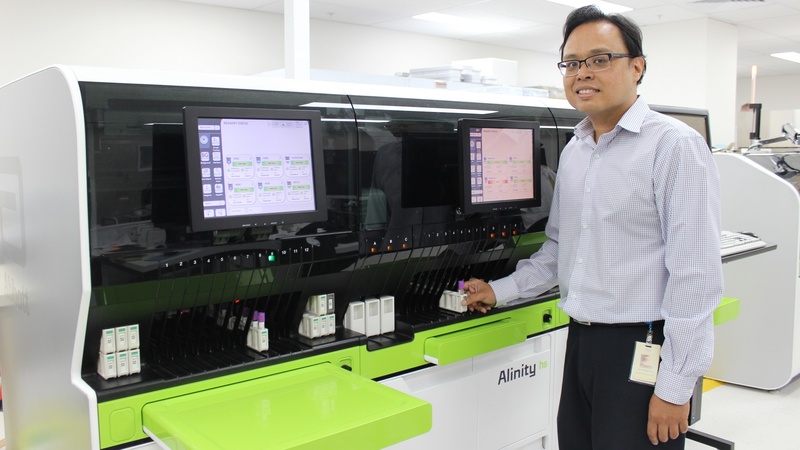 We have demonstrated that these global coagulation assays, including thromboelastography and thrombin generation, are able to differentiate subtle differences in clotting parameters, which are not seen by routine coagulation testing,” Dr Ho says. Using Dr Ho’s PhD as a basis, a thrombosis research laboratory has been established at Northern Centre for Health Education & Research (NCHER), supported by Northern Pathology Victoria, to further address these questions with fellow colleague and PhD student, Dr Yin Lim. Dr Ho hopes to inspire others to consider incorporating research into their lives.